This is an excellent example of how parents can play a fundamental role in making great improvements to the children’s school experience. 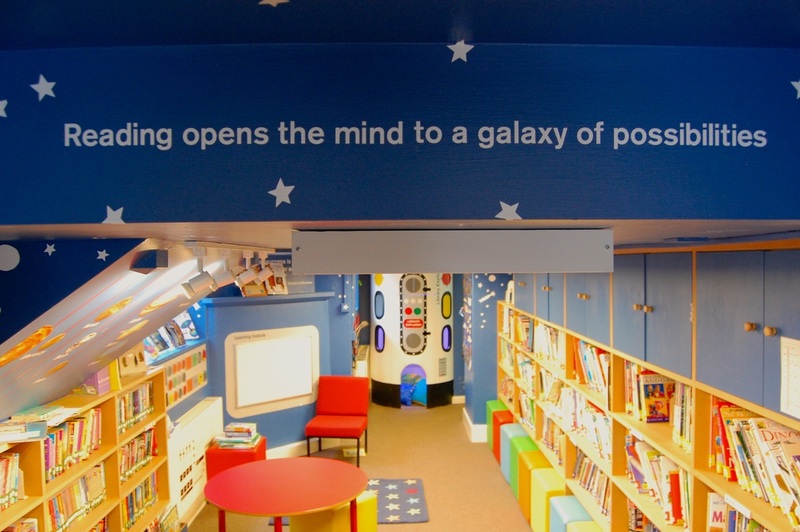 Starting with a request from the Head Teacher to redecorate the tired and drab library, a group of parents saw an opportunity to transform the library into a truly inspiring space. At the start of the project FHS surveyed staff, parents and pupils, to find their views on books, reading, the school and the local library in Nailsworth. It was plain to see that major changes were needed to make the library into a part of the school that children would want to visit. 1) Parents were concerned about the reduction in opening hours of Nailsworth library which was making it harder to access books. Parents of reluctant readers wanted to find things to inspire their children to read, and parents of avid readers wanted access to a wide range of books to feed their child’s love of reading. 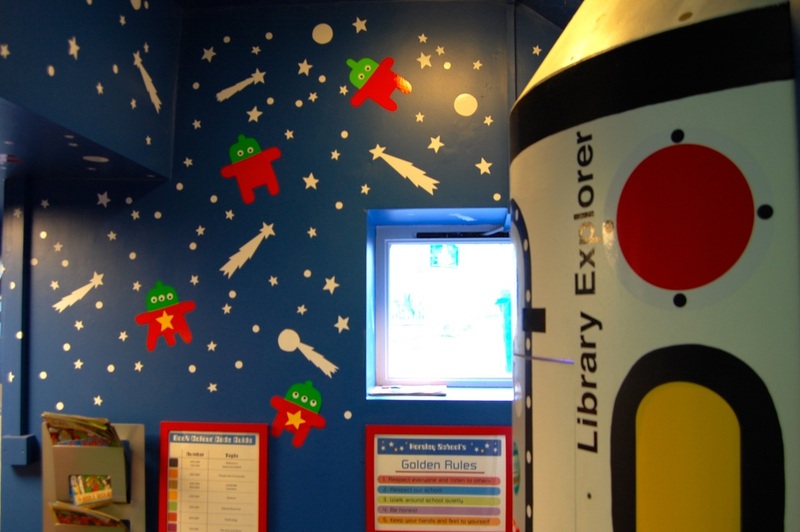 2) Children were uninspired by the library as it was. All fiction was kept in classrooms, so it only contained non-fiction books. As a result, children rarely visited it. 3) The existing layout of the library meant that there was little space to use it for anything other than storing books. 4) The lighting in the library was very poor and there were a lot of gloomy corners. 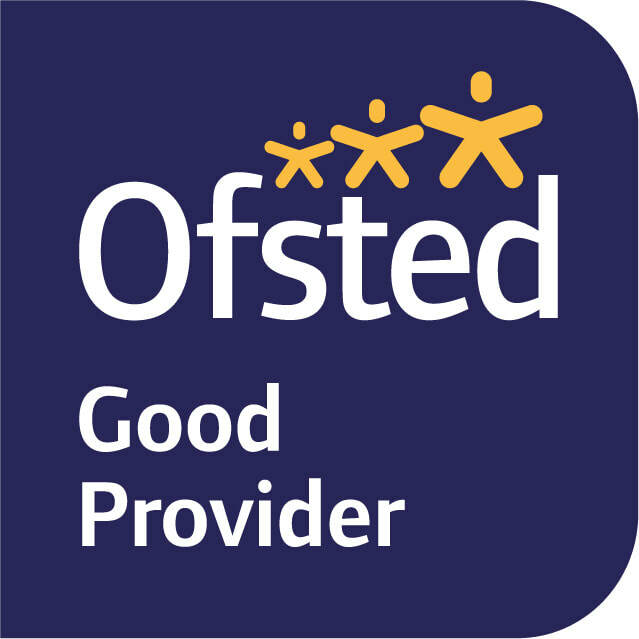 We took the results from our surveys and consulted with Gloucestershire County Council Library Services to benchmark against best practice in other schools around the county and use their wealth of experience in the practical areas. We also undertook some wider research about what elements were needed to make a really great school library. One parent redesigned the layout of the library space to maximise storage and display for books, whilst also making it a useable room for small group work. She had the great idea to use cubed seats which could be easily tucked away when not it use. She also provided 4 different design options, from which the “Space” theme was chosen. An electrician changed all the lighting to energy efficient LED panels, which created a bright, even light throughout the library and lower running costs over time. Our local DIY expert, made bespoke shelves and wheeled boxes to keep picture books neatly under the bookshelves. He also did an amazing job building our ‘Library Explorer’ reading rocket, in which the younger children can sit to read. Finally, thanks must also go to all of the many parents who were involved with raising funds for us to be able to build such a brilliant library. It really has inspired the children to read more, and they love spending time in there. 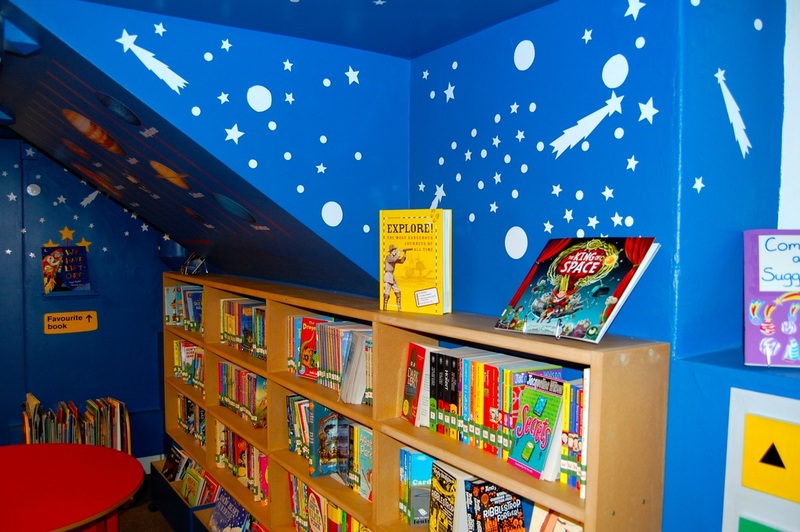 Despite being a small corridor space, we have managed to incorporate several different elements to help promote reading for pleasure for children of all ages and abilities. 1) Fiction Section. We bought lots of new fiction books, from picture books to those which can be enjoyed by the more accomplished readers. These were selected from a list provided by Gloucestershire Library Services; from books chosen from recent children’s book awards; and from recommendations made by pupils. 2) Non-Fiction. Library Services told us that our non-fiction section already had an excellent range, but we decided to update it slightly anyway, to reflect the changes with the new curriculum. 3) Newspapers & Magazines. We have a few subscriptions to magazines that might interest children who don’t readily want to pick up and read a book. 4) Games & Story Cubes. Many games can encourage children to read or use their imaginations without them even realising it. Some also help with Maths too. 5) Tablets. A huge thank you to donations from local businesses towards technology to use in the school library. We have our first six tablets in school which can are used to help children with various aspects of their school work. We engaged local author/illustrator Hannah Shaw to officially open the School Library. Hannah started the day with a school assembly, explaining the process she follows when illustrating stories. Throughout the day, she visited each class and ran workshops so every child could have a go at developing their own characters and illustrated stories. 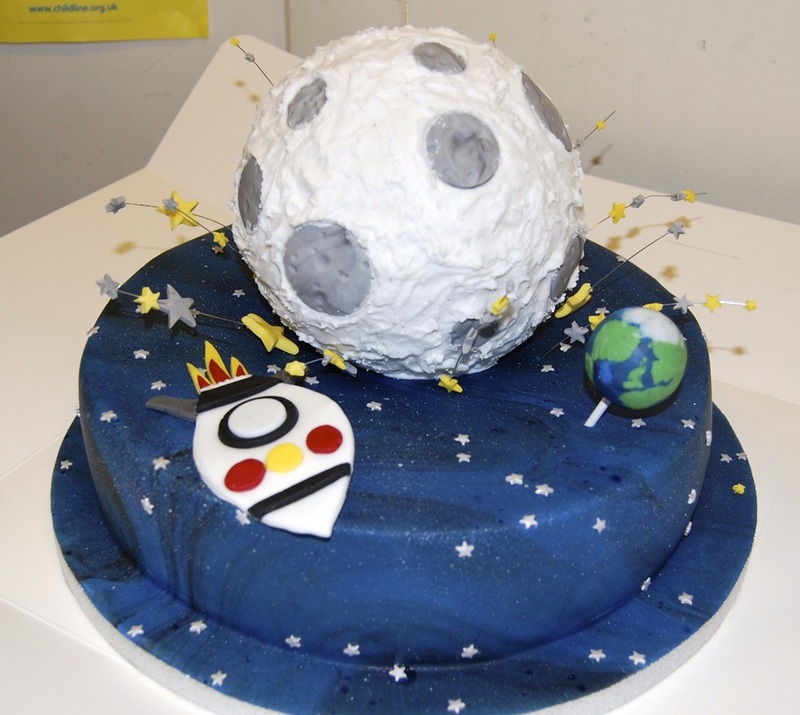 At the end of the day, every single child squeezed into the library where Hannah cut the ribbon for the grand launch, and we all celebrated with a slice of beautifully decorated Space-themed cake. Library monitors keep the library tidy and assist with checking books in and out. Children can borrow fiction books, one at a time, and they sign them out and back in again in their class borrowing book. Parents are encouraged to come into the library after school and help younger children pick a new book to borrow.